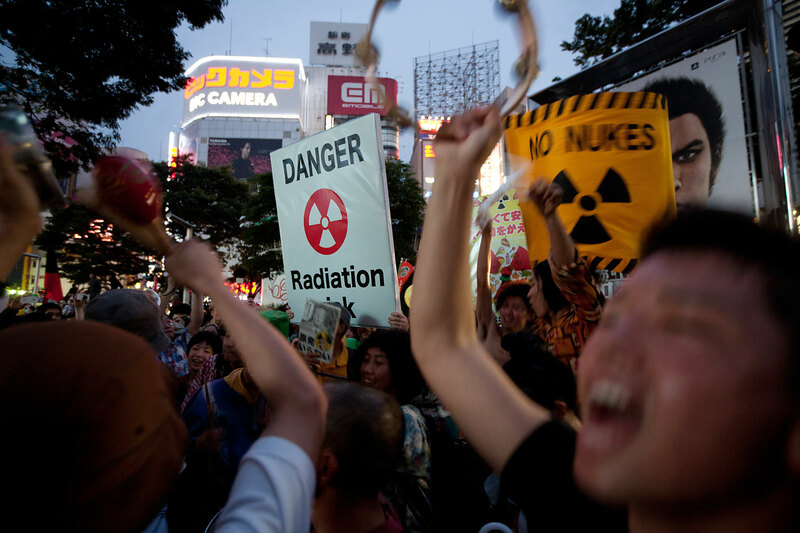 A march/parade, on the three month anniversary of the March 11th earthquake/ tsunami/ and nuclear reactor explosion and melt down at Fukushima Daiichi nuclear plant, takes place in the streets of Shinjuku and Shibuya in Tokyo, Japan, on Saturday 11th June 2011. A march/parade, on the three month anniversary of the March 11th earthquake/ tsunami/ and nuclear reactor explosion and melt down at Fukushima Daiichi nuclear plant, takes place in the streets of Shinjuku and Shibuya in Tokyo, Japan, on Saturday 11th June 2011. The protestors called for an "Energy shift now", from nuclear energy to clean renewable, and sustainable energies. Many protestors also carried flowers and sunflowers, which it is claimed absorb the radiation from the soil in which they are planted.